Beatrix Potter’s best-known children’s stories are now available as a deluxe four-book boxed set that includes a lovable, huggable Peter Rabbit plush! Hop into Beatrix Potter’s classic stories, colorfully rendered by Charles Santore, with this affordable deluxe board-book gift set. 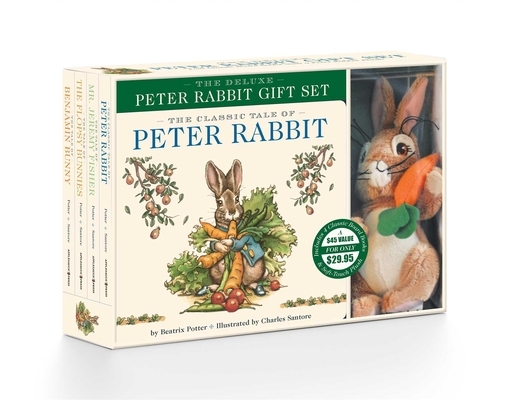 Featuring The Classic Tale of Peter Rabbit, Mr. Jeremy Fisher, Benjamin Bunny, and the Flopsy Bunnies, this set is a great gift for Easter baskets, baby showers, and everything in between. Enjoy the heartwarming adventures of Peter Rabbit and friends while snuggled up with a soft, lovable Peter Rabbit plushie and these four books that are perfect for kids of all ages. Charles Santore is a renowned, New York Times bestselling children’s book illustrator whose work has been widely exhibited in museums and celebrated with recognitions such as the prestigious Hamilton King Award, the Society of Illustrators Award of Excellence, and the Original Art 2000 Gold Medal from the Society of Illustrators. Santore is best known for his luminous interpretations of classic children’s stories such as The Night Before Christmas, The Little Mermaid and Henry Wadsworth Longfellow’s Paul Revere’s Ride, which was named 2004 Children’s Book of the Year for Poetry by the Bank Street College Children’s Book Committee. His illustrations for The Wizard of Oz, which is widely considered to be the quintessential illustrated version, were used as the scenic backdrops for a major television performance of the work. More than 6 million copies of his books have been purchased. Charles Santore lives and works in Philadelphia.